October 7, 2017 10AM-4PM: Open Sew Charity Sewing Quilts for Florida and Houston. OCTOBER 22, 2016 OPEN SEW :: We will work on our QuiltCon Charity Quilt! • MELISSA AVERINOS LECTURE & WORKSHOP! Melissa’s signature class on raw edge appliqué faces! This class was recently taught at QuiltCon 2016! Includes comprehensive lesson on drawing and understanding facial features, instruction and inspiration for creating the face in fabric, short contour drawing lesson to inform the thread sketching experience. All levels. No drawing experience necessary. 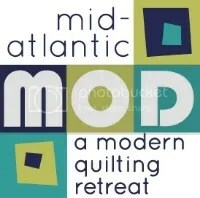 An NJMQG sponsored modern quilting retreat in April 2016! Read about it here. The NJMQG will have a special exhibit called Modern Quilts at the Quilt and Sewing Fest in March 2016! March 2016 Cross Roads Retreat! Read about it here.